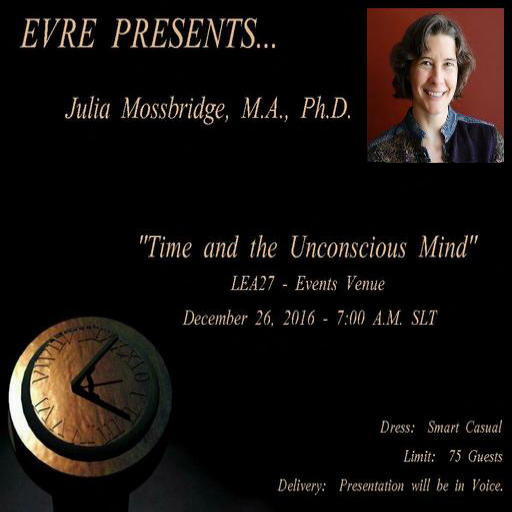 J U L I A M O S S B R I D G E, M.A., Ph.D.
"Time and the Unconscious Mind"
Dr. Julia Mossbridge. What another wonderful Christmas gift for Julia to take "time" from her busy schedule to come visit us on EVRE and share her research. I love Julia because she's in this for one of the same reasons I am - precognitive dreams! She has a fascinating interest in the handshake between ... Don't miss her !! ONE MORE SPECIAL EVENT IS PLANNED - AND IT WILL HOPEFULLY INVOLVE ALL OF YOU AS THE FEATURE EXPERIENCE! !